If the signal of farewell rings in the night sky. I will think of you. Who will go far away someday. I watched you from your left. I looked at the side of your face. Were you laughing or were you crying.? Your long hair was in the way. If the signal of farewell rings in the night sky. It will shine an eternal light. On the path of our weak selves someday. So that we may meet again. I Let My Fear And Insecurities Destroy Our Love, And There's No Way To Turn Back Time. So I Sit Here Asking God For One More Chance In Another Life...To Make Things Right. I choose not to be sad over you but rather to be sad for you. You do not know what you lost but I do! Was it hard? I ask. Letting go? Not as hard as holding on to something that wasn't real. One of the best feelings is finally losing your attachment to somebody who's always hurt you. Instead of sitting around the house & acting like its the end of the world when you go through a break up. Live your life, you're not promised tomorrow. There is nothing you can change that hasn't already been done. Just know that she lost you, you didn't lose anything. Letting go is beautiful but you have to let it be and find someone who appreciates who you are. If you treat me like no one Today, tomorrow you will be no one to me. 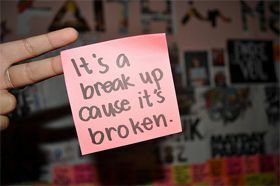 The only possible thing is to think twice before breaking up and not doing things that are causes for the break up. It is harder to live along with a shattered mental set up than to make up for the loss. A broken up mind certainly needs consolation, solace and poems and quotes of similar people are the best way to gain solace. 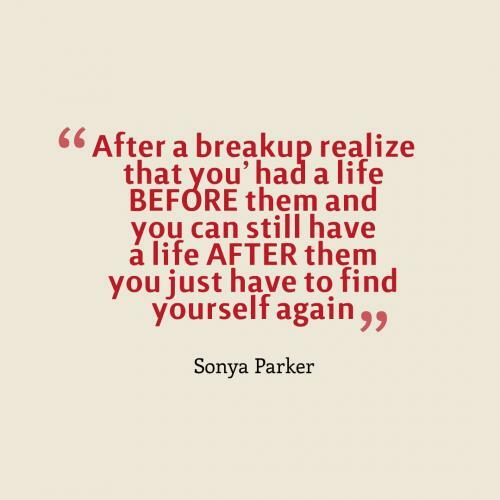 Here are quotes by famous personalities and poets on break up. Read them and share them.